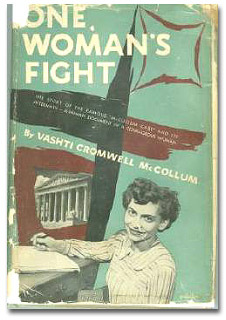 Vashti Ruth Cromwell, named for the queen of Ahasuerus in the first book of Esther, who was one of the few biblical women to stand up for women’s rights, was born in Lyons, New York, on November 6, 1912, to Arthur G. and Ruth C. Cromwell. She was raised in Rochester, New York, and after graduation from a public high school, attended Cornell University on a full tuition scholarship until the market crash of 1929. Transferring to the University of Illinois, she eventually obtained her A.B. in the College of Liberal Arts and Sciences in 1944 and, after interruptions for marriage and children, an M.S. in Mass Communications in 1957. 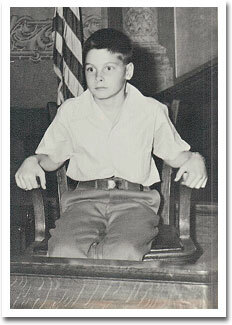 James T. McCollum on the witness stand. After arriving in Champaign-Urbana to attend the University of Illinois, she met Dr. John P. McCollum, a staff member, whom she married in 1933. Their three sons all graduated from college with at least one degree. James Terry, the oldest, went on to obtain a J.D. and practiced law in Rochester, New York, for 33 years until his retirement in 1994. Dannel obtained an M.S. in history and has served for several terms as mayor of Champaign, Illinois. Errol Cromwell, after obtaining his B.S. in mechanical engineering, eventually established a chain of bicycle stores, along with a partner, and was actively engaged in that enterprise until his retirement in 1996. Vashti lived up to her namesake when she and her oldest son, Jim, were confronted with pressure to enroll him in a Christian Sunday School class being offered in the public schools of Champaign during school hours. Resisting the pressure at first, she and her husband eventually relented and allowed Jim to attend the classes throughout the balance of his fourth grade year. However, the following year, the McCollums, feeling that such a program was totally inappropriate in the public schools, refused further participation. This, of course, resulted in Jim’s ostracism by his peers and the suffering of some indignities at the hands of his unenlightened fifth grade teacher. 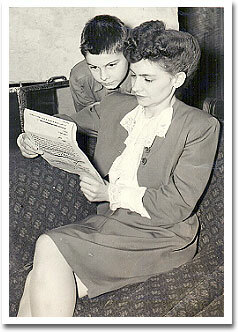 James and Vashti McCollum review a newspaper report on their case. After unrequited attempts to have the program discontinued administratively and after much soul searching, with the aid and support of the Rev. Phillip Schug, the Unitarian minister in town, and with financial assistance from a group of Jewish businessmen in Chicago, Vashti filed a writ of mandamus in the Champaign County Circuit Court in the late summer of 1945. At this point things really became difficult for the McCollums, ranging from physical confrontations between Jim and his peers, to vandalism of their home, to attempts at terminating Prof. McCollum’s employment at the university. Fortunately for Dr. McCollum, his tenured status secured his position with the university. However, Vashti’s employment as an adjunct instructor in the women’s physical education program, was terminated. The three-judge panel, sitting to hear the case in the Circuit Court, decided that, in spite of the clear language in the Illinois constitution to the contrary, the practice violated neither it nor the establishment of religion clause of the 1st Amendment of the U.S. Constitution. The Illinois Supreme Court agreed with the lower court and the case was appealed to the U.S. Supreme Court, which granted certiorari in the fall of 1947. On 9 March 1948, the US Supreme Court handed down its landmark decision in the People of the State of Illinois, ex rel McCollum -v- Board of Education, 333 US 203 (1948), a decision written by Justice Hugo L. Black, that was to become a landmark case in U.S. constitutional law. The significance of the decision was that it was the first case of impression that held the states accountable to the strictures of the “establishment of religion” clause of the 1st Amendment of the U.S. Constitution under the aegis of the due process clause of the 14th Amendment. All cases, involving school prayers, aid to parochial schools, sectarian religious displays on public property, and other such incursions into Jefferson’s wall of “separation of church and state” by the states and their municipalities, descend from this case. 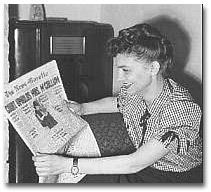 As in any such case and particularly in this one, because of the McCarthyistic mood of the late 40’s and 50’s—when Communism was considered the scourge of humanity and atheists were considered by many as either Communists or fellow travelers—this case took its toll on Mrs. McCollum and her family. However, she was resolute, as was her namesake in the Bible, and persisted, despite disappointing losses in the lower courts, until she finally triumphed with her decisive 8 to 1 victory in the high court. For the results of this case alone, if not for her courage and perseverance, she deserves recognition in the annals of U.S. constitutional law. 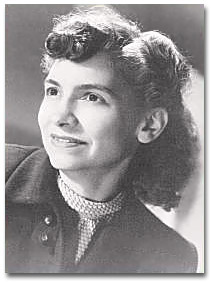 Among the awards and recognition accorded her in subsequent years were the prestigious John Haynes Holmes Award (now the Holmes-Weatherly Award) from the Unitarian Fellowship for Social Justice, the second person to be so honored. (Other recipients were Whitney Young, Roger Baldwin and the Rev. Martin Luther King, Jr.). She also has received recognition from the Illinois ACLU, the Champaign County Chapter of the Illinois ACLU, the Roger Baldwin Foundation, Americans United for the Separation of Church and State, the Rochester, New York Chapter of Americans United, and the American Humanist Association. — By Patrick Murfin, President of the Congregational Unitarian Church, Woodstock, Illinois. Abridged from the website of Vashti Cromwell McCollum. Mrs. McCollum of Champaign, Illinois, found that her children, like others in the public schools, had to choose between using “released time” for sectarian religious education and being treated as social isolates. She was sending her children to the Unitarian Sunday School, and she did not want to have her freedom of conscience—and that of her children—denied by forcing them to enroll for either federated Protestant or for Roman Catholic instruction. The McCollum case became another bulwark against the encroachment of churches and their sectarian differences as such—not of religion and morality in a broad sense, it should be noted—upon the public schools, even though a decision this year written by Justice William O. Douglas apparently weakens the Supreme Court’s position again. — By Alfred McClung Lee, from the Christian Register of the American Unitarian Association, September 1952. McCollum, Dannel. The Lord Was Not On Trial: The Inside Story of the Supreme Court’s Precedent-Setting McCollum Ruling . Americans For Religious Liberty, 2008. McCollum, Vashti Cromwell. One Woman’s Fight . Beacon Press, 1961; Freedom from Religion Foundation, 1993.